Lectures, warnings, hollering, bribes, second chances and reminders do NOT work. You are wasting your time and breath. Your youngster knows the rules – he just refuses to obey your rules! Remember – her actions are often automatic responses learned from infancy. Your youngster is in their element when you have lost your control! • Broken object – they must replace it with their own money or with chores. • Did not bring homework home – go back and get it or assign your own homework. • Does not want to eat – no problem, they will not starve, but they will sit at the table while the family eats (NO snack before next meal). 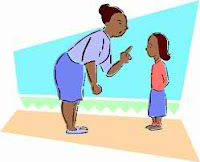 • Foul mouth, raised voice, rudeness, and back talk – can be rewarded with chores, exercise (jumping jacks, sit ups, running on the spot) or payment to money jar. • Hurt someone – they must apologize and lose privileges (having friends over, watching TV, playing video games, using the telephone, etc.). Most likely, they will not mean the apology, but it is a habit-forming process. • Misbehaving at dinnertime – remove them from the table. They can go to their room until dinner is over– so the rest of the family can enjoy a peaceful meal. • Room not cleaned – stay in your room until it is clean. Avoid control battles! Your youngster wants to control you, even if it means making you angry and them being disciplined. No one wins and you will end up frustrated. Try, “When you clean your room properly, you can have ____,” (lunch, playtime, etc.) –whatever fits the daily schedule. Never believe your youngster, “Honest, Mom, I’m telling the truth! Why won’t you believe me, you never believe me!” Don’t let that sway you; your youngster is one of the best liars around. Should a miracle happen and you later find out your youngster was telling the truth; look them in the eye, apologize sincerely and reward – perhaps with a favorite dessert/comic/hug. If you find that more and more your youngster has told the truth, then you can start to let your guard down. Give compliments in “now” time. “You showed great sportsmanship today!” or “You did a really good job on the dishes. Thank you.” Do not be surprised when your youngster sabotages these good moments. This is their only way of regaining control of their environment. Until they learn to trust you, this is their safety net. Disciplines and punishments should also be in the ‘now’ time. Groundings for the week(s) may sound good to you but your ATTACHMENT DISORDER youngster lives in the ‘now’ mode. Cause and effect are not easily understood, if at all; especially if the effect lasts more than a day or two. You will find that if the grounding is too long or heavy your youngster will act out even more as they think, “Why not, I’m already grounded from everything”. Each week have a roll of $2/nickels or $5/dimes and place in a jar; then for each negative behavior take a nickel/dime out of the jar. At the end of the week your youngster gets to keep the money in the jar. Be sure to point out how much money was in the jar at the beginning of the week. Do not leave ATTACHMENT DISORDER kids in the care of adults that will allow the youngster to manipulate them. No youngster will trust and respect others who are weaker than them; this includes grandparents, childcare, teachers, etc. Weak caregivers will just reinforce your youngster’s belief that adults cannot be trusted and they can only depend on themselves for survival. The strains a Reactive Attachment youngster puts on your family can be enormous. • An ATTACHMENT DISORDER youngster will play one parent off the other, which could result in a rift between parents. • Dreams of the perfect loving, caring family are squashed. There is no such thing as perfect family, but an Attachment Disorder family can become quite dysfunctional. • Due to youngster’s disruptive behavior, parents often withdraw from social functions. • Family events, like Christmas, can be filled with anger and frustration due to RAD behavior. • Friends, family, church members become critical of parenting and attitude. • Parents appear to be unfair, strict and sometimes hostile, as parenting skills used with healthy kids do not work with RAD kids. • Siblings and pets can often be targeted and threatened. It is extremely important for RAD kids to have their own room - for their own good as well as the safety of siblings. • Siblings often feel ignored or overlooked as the RAD youngster takes up so much of the parent’s time. Schedule, daily or weekly, one-on-one quality time for each youngster in the family. One of the hardest parts being a parent of a RAD child is the isolation. They are so good at playing cute and adorable around other people while trying their best to control and manipulate parents at home with destructive behaviors, nobody understands why you are so hard or strict or telling lies about their behavior that you avoid social interactions. They are abusive to caretakers to the point of isolating them. The "nice" in public is a manipulation used to control caregivers. I totally understand. I feel the same way. and nobody can hear me. I have an 8 year old and I have taken her to the sheriff's dept today because I just don't know where to go. We do counseling every single week. she has activities outlets. She has her own room and yet she destroys her sisters things nearly every day or at least every week. I am just so tired...we adopted them 3 years ago, they are our blood granddaughters. She has manipulation to a T.
I feel so greatful to have found this page as nothing seems to work for my 14 year old who seems to be suffering from RAD and anxiety. We've had our 17 yr old foster daughter with rad for almost 4 years. Keeping calm is imperative! If the child is in a dangerous situation, just get them out of it, don't focus on talking to them about it until later.in a disagreement state your thoughts etc briefly then let your child have time to think about what you said, it may take an hour, continuing to argue they will forget everything you said. I think about it like talking to a very drunk defiant person, let them sober up, then after calmed down , have a calm conversation.good luck!